This is the second of two posts in which we present a new attack vector on the routing infrastructure of the Internet using BGP communities. In order to investigate to what extent BGP communities can be leveraged for attacks, we conducted two kinds of experiments: lab experiments and active measurements to validate our lab results. The latter required careful analysis of potential side effects as well as support and consent from the involved operators. In this post, I will focus on the experiment with the strongest real-world impact: Remotely Triggered Blackholing (RTBH), which is commonly used to mitigate Denial of Service (DoS) attacks. Figure 1 — An example of how Remote Triggered Blackholing (RTBH) works. Figure 2 shows an experiment we developed to confirm if RTBH can be exploited to launch Denial of Service attacks itself. Figure 2 — AS2 triggering blackholing in AS3 for prefix announced by AS1. peers — 48 peers instead of 3 peers in the previous hour. We acknowledge that BGP communities are the only feasible way to do signaling between ASes and that implementing complex security mechanisms to address their shortcomings is not the solution. Nevertheless, we would like to highlight that secure usage of BGP communities requires good operational knowledge and diligence. While many operators are familiar enough with these challenges, based on experience we cannot rely on that globally. In order to realize RTBH, blackholing providers need to accept very small prefixes in IPv4 (for example from a /24 to a /32). For this to occur, an exception for prefixes tagged with blackholing communities has to be added to the configuration. That said, this configuration path often lacks proper prefix validation — we found that some providers generally check the blackholing community before any prefix filters are applied, which means providers might accept invalid blackholing announcements. 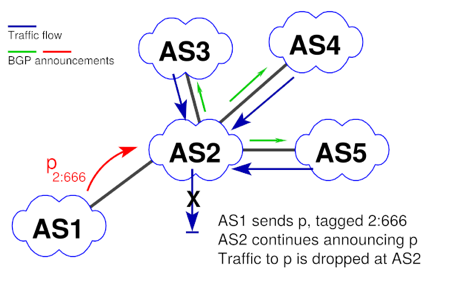 Filter incoming informational communities with your ASN at your border routers. Publish up-to-date documentation on your communities to enable debugging and filtering to enable your customers to filter communities received from their customers that would trigger unwanted actions in your AS. Provide a looking glass that also shows communities. This is supported by the fact that while the prefix hijacks we did — with operators’ consent — had been reported publicly, no one noticed or reported our community attacks that led to blackholing and redirection of traffic. Florian Streibelt is a PhD candidate at the Max Planck Institute for Informatics in Saarbrücken, Germany. His research interests include the DNS, Internet measurement, protocol design, interdomain routing, security and data analytics.